Two multi-national companies have been fined after the death of a gas rig worker off the coast of Norfolk. David Soanes, 59, of Lowestoft, died on 11 November 2005 after falling 20ft (6m) while repairing a stair well. The mechanical engineer had removed two steps, but stepped through the gap and fell to his death on the platform. Both Shell and AMEC admitted breaching health and safety rules and were each fined £150,000 plus £41,500 in costs at Norwich Crown Court. There were no members of Mr Soanes family in court but Judge Peter Jacobs said Mr Soanes was a responsible worker. He said companies like Shell and AMEC had a responsibility to look after their staff in such hazardous working conditions. 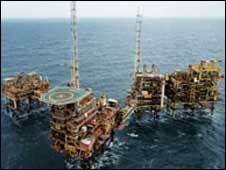 Mr Soanes had worked for AMEC as a mechanical technician for 12 years and was working on the Clipper offshore platform in the southern North Sea when the accident happened.